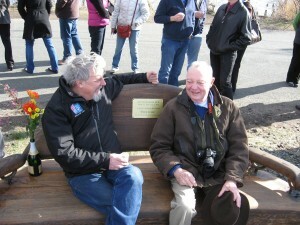 Friends of John Diebold chat during dedication of a memorial bench, fall 2010. After John Diebold, an enormously popular and influential marine scientist, died suddenly in summer 2010, friends and family resolved to erect a memorial to him. During a long career at Lamont-Doherty Earth Observatory, Diebold had spent seven or so of his 66 years at sea on all the world’s oceans, and many more preparing for cruises and writing up results. Those who cared about him settled on a handmade bench, made of red oak carved to look like driftwood, joined with salvaged nautical-looking pieces of iron, all weighing about a ton. An attached plaque dedicated it to Diebold with the inscription: GONE TO SEA. The bench was installed on a causeway along the Hudson River in Piermont, N.Y., leading to the dock from which he and many other Lamont scientists had departed in years past on various research vessels. On Oct. 29, 2012, Hurricane Sandy struck the New York City area, bringing death and destruction, and sending a gigantic storm surge up the Hudson. Among the casualties was the bench. In what could be viewed as a perfect coda to Diebold’s life, it had floated off into the storm waters and disappeared. Post- Hurricane Sandy, the bench washed up on the Hudson riverbank. But that was not the end of the story. A day or so later, among the jetsam of loose lumber, smashed boats and pieces of people’s houses, neighbors spotted the bench. Battered but intact, it had traveled upriver and come to rest near the foot of Piermont’s Ritie Street, about a mile from the pier. Someone nailed a note to it begging civil authorities not to haul it away as trash. Ted Koczynski, a Lamont staff engineer who had sailed with Diebold, went over to look. It seemed like a bad idea to move the bench back by the pier; many scientists including some at Lamont had long warned of just such surges, and made it clear that rising sea levels would in the future help bring more. So, he and others offered to take it to the Lamont campus, which sits high on a cliff above the river. They wrestled the bench into a dump truck with the help of a large forklift, and brought it back. 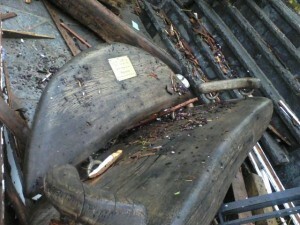 As of now, the bench sits in a warehouse awaiting repairs. Lamont oceanographer Greg Mountain said colleagues were considering reinstalling it somewhere in between the cliffside oceanography and administration buildings, where it would have a fine view of the water below. At about 380 feet above sea level, this should “give the bench a setting immune to rising waters for a long time to come,” he said.